… gotcha! No hugging here. 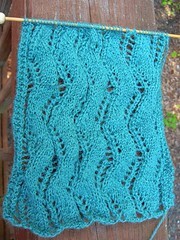 The last of the first ever Embrace the Lace club, by Woolgirl. While I really loved each and every kit, I still haven’t knitted the first one. I’m on a club diet. I’ve belonged to 3.5 sock clubs (split one with a friend) and this lace club, and haven’t knitted the first thing with any of the yarn yet, to my recollection. 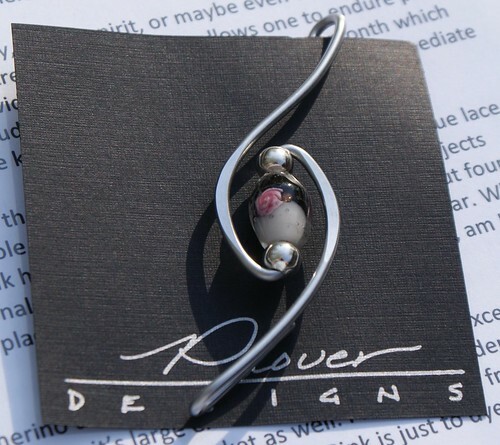 That’s the larger than life look at the shawl pin, from Plover Designs. I really, REALLY love that pin! 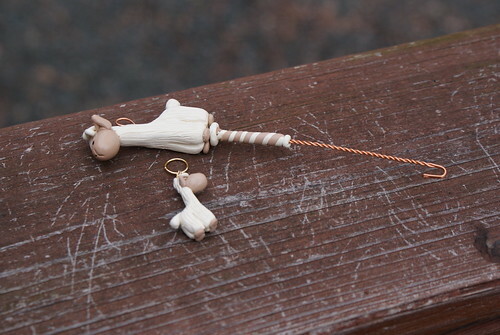 But I’m just twitchy-itchy to try the stitch marker, also by Plover. 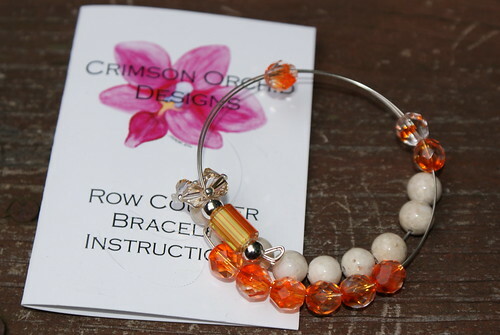 I like my stitch markers to fit kinda’ closely, and I LOVE that this one is two sizes in one! The understanded elegance of the bare metal makes me happy too. I’d go home and cast on now if only I could! 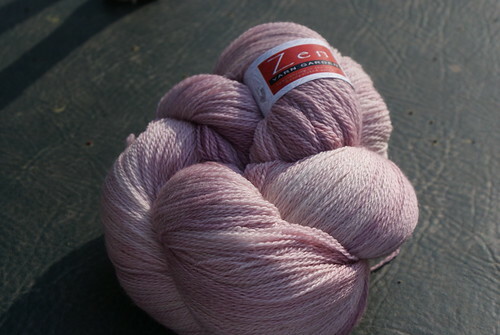 The cashmere blend laceweight by Zen Yarn Garden is spectacular too, but I already have a laceweight silk blend project on the needles that I’m ready to tend to! How goes your week thus far? Anything exciting? I bet we won’t get mail today, but that’s okay, because the past week has been VERY good to me. 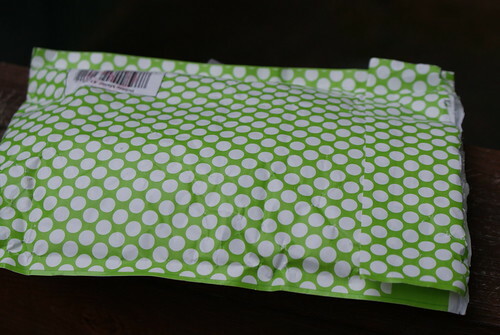 It started with a sock club kit last week, and goes through the three parcels I had to open yesterday, and you just have to see them. The photos aren’t great because the snow clouds had already moved in, and I wasn’t dressed to stand out in what natural light there was and snap photo after photo, but you’ll get the idea. I love the detail Anita puts into her creations. 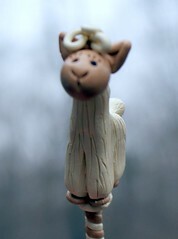 Isn’t that the cutest little clay alpaca? I’m not sure I can leave it hanging on my wheel, given Sissy’s latest path of destruction. Both girls recognize Auntie ‘Nita’s scent and go ape when she sends even a note, much less something she’s crafted with her own hands. Still, I have my own alpaca – two of ’em! I’m so blessed to have talented friends. 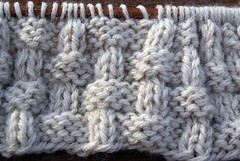 Do slip over to Episode 55 of Manic Purl’s podcast. 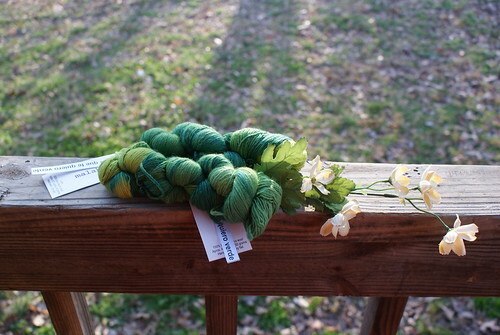 Dear Jessi got a much-deserved rave review of her SpringValley Yarns. She’s famous!! I’m glad I have an inside track, because I almost always have something on the needles with one of her yarns. 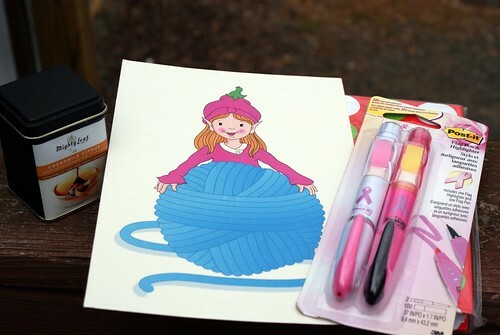 On Tuesday, Amanda of NH Knitting Mama had a shop update. I scored a “seconds” version of Franconia for a steal. I MEAN A STEAL!!!!! Amanda offered it as a second because one ply of the base didn’t take dye the same way the others did, but I *LOVE* it. 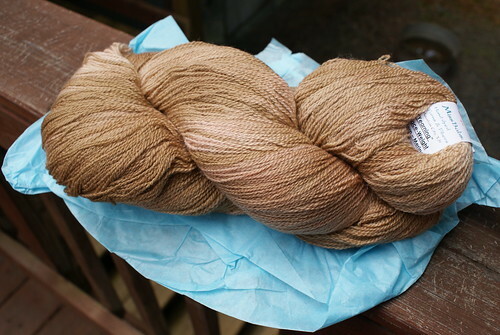 I also have a custom alpaca laceweight she dyed for me at the start of her dyeing career on the needles right now. 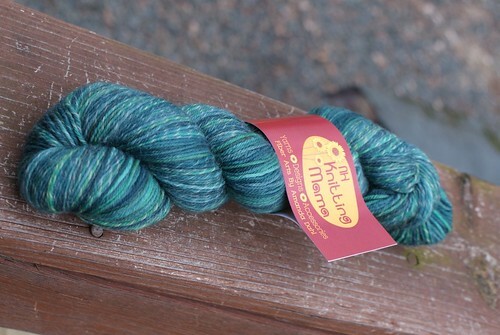 In keeping with the friends who dye theme, the most recent sock club kit from Dianne of Creatively Dyed Yarn. Each of my indie dyer friends has her own style and base yarns, and I really think I could tell them apart with my eyes closed even! 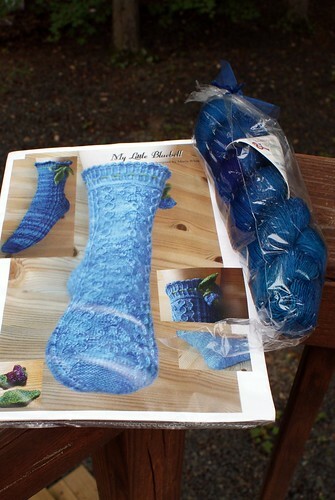 I’ve never knitted socks with beads, but I’m going to have to with this kit. 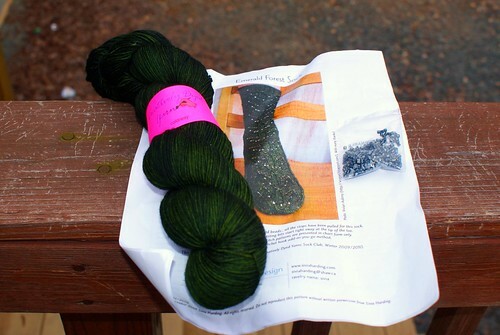 Check out the pattern page on Ravelry for Sivia Harding’s Emerald Forest Socks! I know this is a painfully long post, but go grab a cuppa’ and a bite to eat because there’s still more! A few days ago, Grace’s Master Blocker challenged her readers, and because he must think like the Knight, I won! 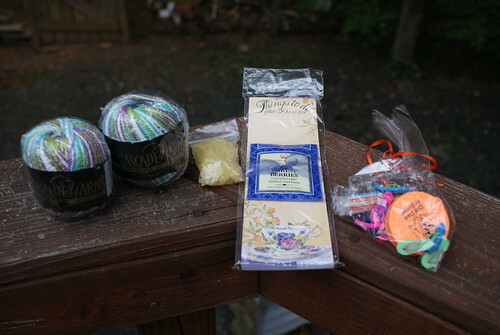 I received the beautiful yarn above, and the extra goodies below. 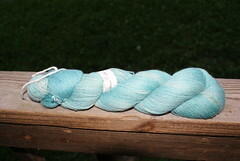 I can’t wait to wind it up and knit with it. I think it wants to be a shawl for me. What do you think? Grace must keep notebooks on what her friends like, because she always sends the most thoughtful packages. I’m sipping the Mighty Leaf Chamomile Citrus now, and I think I’m in love. I’d never tried Mighty Leaf teas before, but I think another parcel will be on my porch about the time the mail carrier can get to us again. I’m also ridiculously fond of those highlighters with the built-in sticky flags and notebooks. The red dotted thing almost hidden is a little notebook, in case you didn’t put that together from my almost random comments. 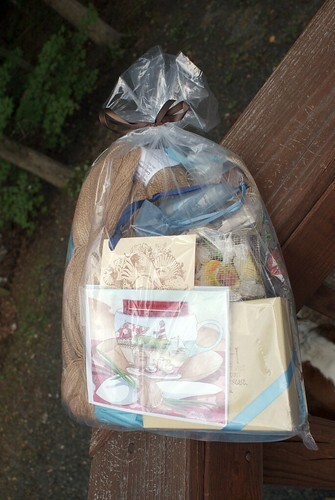 I’ll just briefly note another Embrace the Lace package floated in this week too. I think there’s only one more to go, but I’m honestly not sure. 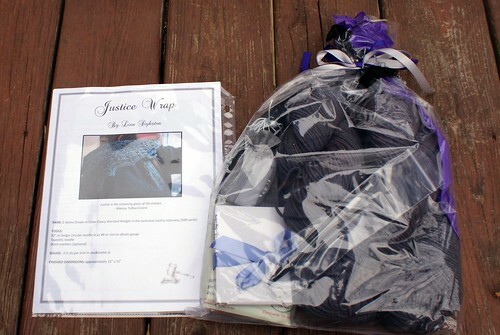 Justice is grey, and that’s a shawl in the pattern. There are better photos in the Ravelry group, of course. My fingers were too cold to peel off all the protective wraps, or to get all around photos, but after I load that baby up and tote it around for a few days, I’ll do better and tell you what I really think. I’m getting more behind every day, so I’m going to double or even triple up here today. 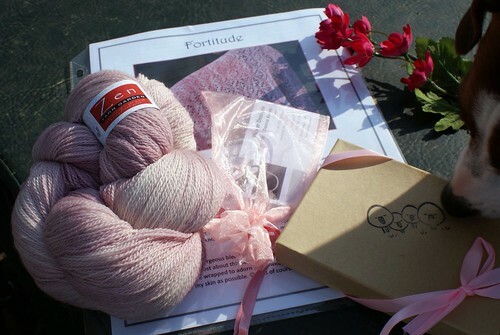 Last week, my third Embrace the Lace Club kit arrived. Really, no one does a club kit like Woolgirl. Every last detail is so very carefully thought out. It’s more expensive than my sock club, but WOW! the stuff I get with it! 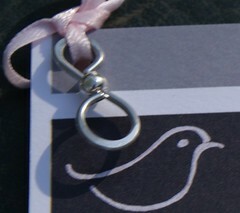 It would take all day for me to show you EVERYTHING, and the extras in this kit really hit home with me so I’d love to share them all with you, but in the interest of time, just look at this one item as a symbol of the thoughtful details that go into everything in each kit. I need to bring the taffy in for MJ. As much as I love all things beach, I’m not crazy about taffy. But shells! 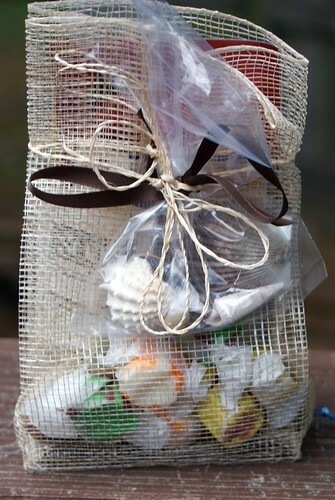 Those shells were collected by hand, not just purchased in bulk from some online source. 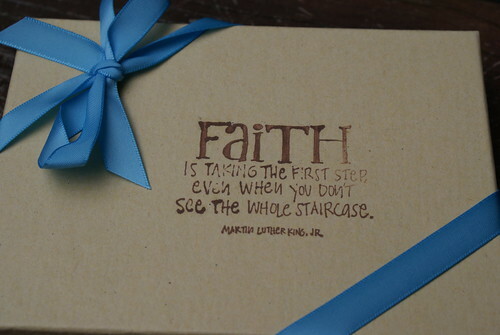 Since the club this year is based on the Virtues, I should mention that this month’s theme is FAITH. For me, I could tie most any of the virtues to the beach, because it really is where my spirit is restored, but it’s fun seeing how the designers and Woolgirl take each virtue and develop a kit. More hot green? You betcha’, but it’s not the FO report I owe you. I’m blessed with some of the best friends ever. Wendy sent me a happy little friendship package! Her timing was perfect; I really needed a distraction on the day it arrived. She had no way of knowing that the Fixation she sent was the same colorway I’d picked up more than once, but put back because I have Fixation in my stash already… The bath crystals smell so sweet! 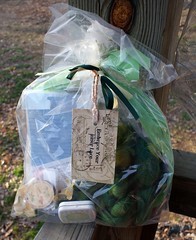 I had a hard time keeping the dogs from the little packet because the scent is soooo tempting! Wendy always is sending/bringing me tea, so I laughed when I saw a notepad with tea attached. Perfect! 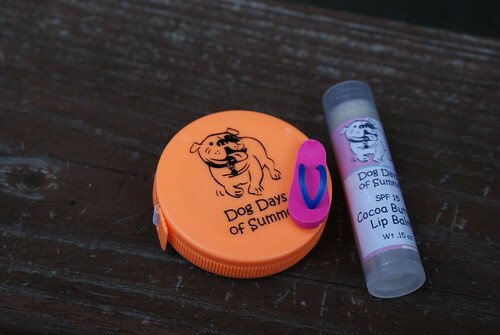 You have to see the Dog Days of Summer goodies Wendy shared! There’s a whole mess of the little flipflops, which I intend to use as stitch markers, I think… And I always have a tube of lip balm within arm’s reach, so as long as Sissy doesn’t find it and eat it, I’ll enjoy that too. Thank you, Wendy. It’s been too long; we need another get-together! How goes your one-day-closer to Friday? My brother inlaw insists it is another Monday, but I’m not feeling that, thankfully! Mrs. P. (the dear woman married to Pissy) called yesterday to mention that there was a car in at the dealership where they both work that I really should come test drive. So, I did, but more just to rule it out than anything else. You see, several people who know me well – including the Knight – think I need to at least consider sedans in my hunt for the next vehicle in my life. 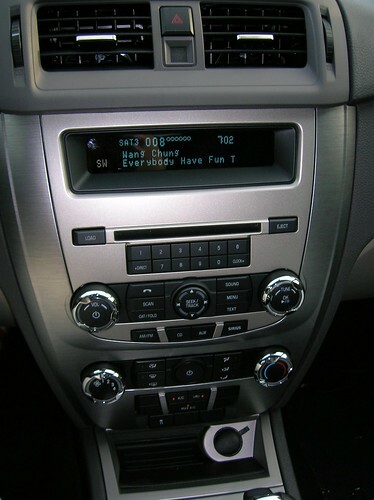 I’m still not sure about that, but I can tell you I was unexpectedly pleased behind the wheel of the 2010 Ford Fusion. Admittedly, the model I drove didn’t have some of my musts, but I still got a good feel for the vehicle, and liked it enough to ask the salesman to call me when they get an SLE in. SYNC. Without any instruction, two touches allowed me to find my beloved ’80s station on Sirius radio. 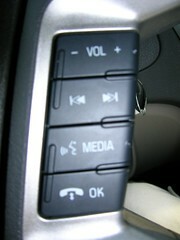 I know the Knight would love all the other things SYNC will do for us, including its E-911 feature, included in the SLE. The ride. That means comfort, quiet, steering… the works. The sunroof. (Moonroof? I know there’s a difference, but I have to have the kind that is power, slides all the way open or tilts up just to vent that hot air this time of year.) I’d forgotten what it was like to have a vehicle with a sunroof you can use at any speed without all sorts of weird pressure issues inside the cabin. 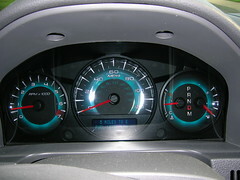 Fuel economy. It’s conceivable that as much interstate driving as I do, I could get 31 mpg. That’s roughly 30% more than my average now, and still 25% or so more than the best we’ve ever gotten with the Lexus. The Ford dealership is literally “over the hill” from our shop. Not that I plan to have to be there much, but it’s as convenient as it gets. It’s smaller than the Lexus in the passenger compartment. It has a trunk, not a to-the-roof cargo area. If it came in a wagon, I think I’d have fewer reservations. As it is, I’ll drag the Knight along when they get one in with all the features we want. The summary: The 2010 Fusion didn’t eliminate itself. Instead, it leaves me confused, and wondering where the compromise between cargo and fuel economy will lead me. So, for the knitting bit. 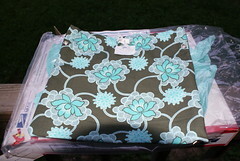 It’s a spoiler, so if you don’t want to see photos of the second Embrace the Lace kit, you’d better stop reading here. Okay, here come the spoilers! 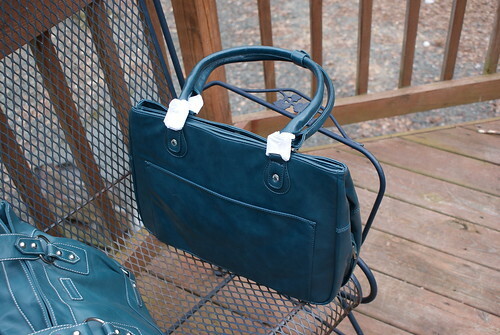 The most beautiful project bag, in my (today anyway) favorite colors… It’s a Julip bag, designed just for delicate lace projects! I must confess that I didn’t know of such a thing, and I’m eager to try it out. 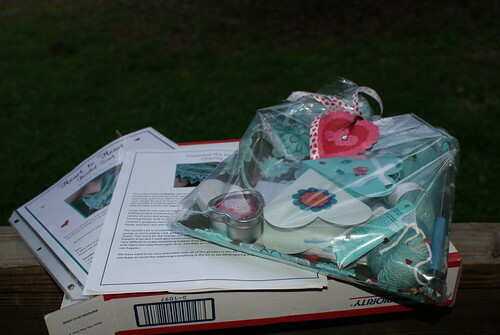 MJ is crazy about the heart boxes that held beads for the project and a stitch marker. She’s really impressed with Woolgirl’s extras too, at least with all the handmade papercrafts that are in each package. 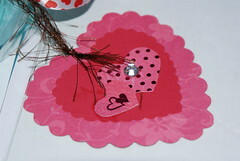 Here’s the heart too, just for the other crafters out there. There were also all kinds of heart confetti sprinkled within the package. I’m pretty sure the fur-girls ate a piece or two each, but considering their adventures on Saturday, I’m sure a few sparklies won’t hurt ’em. Well, this is long enough, so I’ll stop here. How goes your Tuesday? Firstly, I can admit I have knitter’s ADD. If it isn’t quick, small or a fun challenge, I get bored, no matter how much I’d like to finish the project. See this? I love the yarn, hated the pattern. Can’t even finish the third repeat. Decided in the fall I’d grind through it as travel knitting and gift it for Christmas. Nope. That only got me through the second repeat. Thought briefly about gifting it earlier this year, and that caused me to start the third repeat, but I’ve come to the conclusion that yummy yarn wants to be something I can knit with love. Secondly, I have things on the needles for DEAR friends and my favorite aunt (sniff, sniff… only one of those now). I like the projects, I want to gift them in a timely fashion (okay, the wool forthebeach hooded scarf for Aunt will at best be an anniversary gift in the fall), but I can’t seem to pick any one of them up on a regular basis and make real progress. 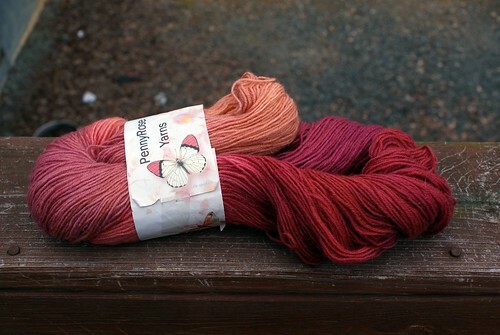 I really want to cast on for Fauxibus (although I’ll be doing the moebius version) with its Malabrigo Lace. Having it at the ready, sitting there staring at me, is motivating me at the moment. Thanks Grace, for helping me get motivated!! Don’t forget today is Earth Day. 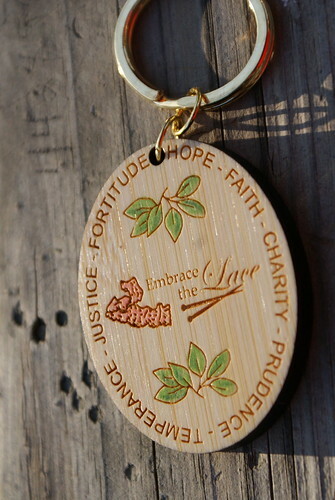 Are you doing anything special to celebrate?